The badger emergence starts at 5.30 pm for the early badgers and up to 3.30 am for the later lonesome badgers. 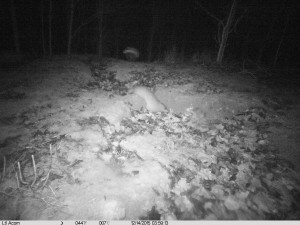 The two badgers in the background make off while the lonesome badger (this is the first recorded emergence in 2 nights) emerges and quickly makes off. The “Lonesome” badger emerges 23seconds into the video. A Jay visited our running water hide recently looking in very good condition.